Most first time entrepreneurs think that brand is only a logo but it’s so much more than just it! A brand is who you are, it is the way you look, the way you speak and the way you behave. When I stepped my foot in the business for the first time and was about to launch my enterprise, I was one of those who cared about the name and the logo the most but didn’t think too much about my brand’s personality. It was a huge mistake because I wasn’t sure about my brand’s voice when talking with an audience on social media or when writing emails. That’s why I want to help you to figure out what your brand is and what does it stand for whether you’ve already launched it or not. I’m not gonna lie, branding takes time and a lot of research but at the same time it’s a lot of fun. There are some particular aspects you have to think about (and write them down!). First of all, you have to decide, who you are. What does your brand aim for? What is your mission? How you differ from other similar businesses? Why should a potential buyer choose you instead of your competitor? What are your values? You have to identify what your brand stands for and why customers should choose you. When you’ll know, who you are, think about your brand statement and tagline. The statement should sum up what you’ve come up with when deciding who you are. It should be 1-2 sentences, answering what you are the best at, who you serve and how you do it uniquely. Meanwhile, the tagline should sum up your brand statement, which means it has to contain only keywords that represent you best. It’s time for the logo. If you consider yourself artsy, I suggest you create the logo by yourself because you’re the one who knows best what your brand stands for and how it should be represented. If you can create a logo but have no idea how to make it digital, find a graphic designer on dribbble.com, behance.net or fiverr.com who could digitalize it, it shouldn’t cost much since all they would have to do is to repaint it. Though, if you don’t think you will be able to create a logo that could represent your brand well, find a graphic designer and let them do their job. Besides, I highly recommend you to find a freelance graphic designer instead of branding agency because agencies have a lot of large scale clients so your order probably will be postponed quite often since you’re a small business (yes, that’s true, even if they promise you to finish it on time). Also, agencies charge much more than freelancers. Oh, and don’t forget that you will need a logo, reverse logo and an avatar. In branding colors are incredibly important, they create mood and the atmosphere of your brand so choose them carefully. On the internet, you can find a lot of information about the impact of colors in branding but what’s most important is that you would know who exactly is your target customer and how you want to make him/her feel. It’s no secret that women prefer light and bright colors while men tend to like dark shades more but at the same time, you have to remember what your brand stands for, by combining all these aspects you will come up with some colors that suit you best. You can find a lot of inspiration for brand color palette on Pinterest, you can also analyze similar brands that you like (only the ones that you like, because often it is about the emotions and feelings that the brand’s colors create). How many colors do you need? Around three but you can decide on five, in case you’ll need more. To create your own palette use coolors.co, it’s a great platform for creating your palette from scratch, picking colors from an image you like or by adapting the palettes created by others. Oh, I love typography part of branding! There are many wonderful fonts you can choose from and the ones you’ll choose will have a great impact on your brand identity. Usually, a brand needs one or two fonts – one for everything or one for headlines and another one for the body. If you’re willing to pay for your font – great, just go find the ones you like most! Though, if your branding budget is tight, you can always find fonts that are free even for commercial use and still look pretty awesome, just don’t forget to select that you’re looking for “free for commercial use” fonts in your search settings. When it comes to elements and icons, you have two options – find vector files online or ask a graphic designer to do them. What exactly I have in mind when talking about these? Usually, it’s social media icons that you use on your website and sales/marketing materials (e.g. business cards or promo leaflets with links to your social media accounts). Honestly speaking, if you don’t need super extravagant icons, simply find the ones online and use them. You can find pretty good free icons by typing “Social Media Icons Vector Free” in a search engine. Though, if you want your icons to stand out and match your brand instead of being generic, you better go straight to a graphic designer and let him/her create them. Voice and tone are extremely, I mean it, extremely important for your brand! You have to have a clear vision about the way you speak, what emotions you awaken and how your reader/listener feels. The voice and tone of your products’ descriptions, blog posts, emails, social media texts have to be the same and they must match with your brand. You have to know who you’re speaking to, think about your target audience and adapt your voice and tone to them. 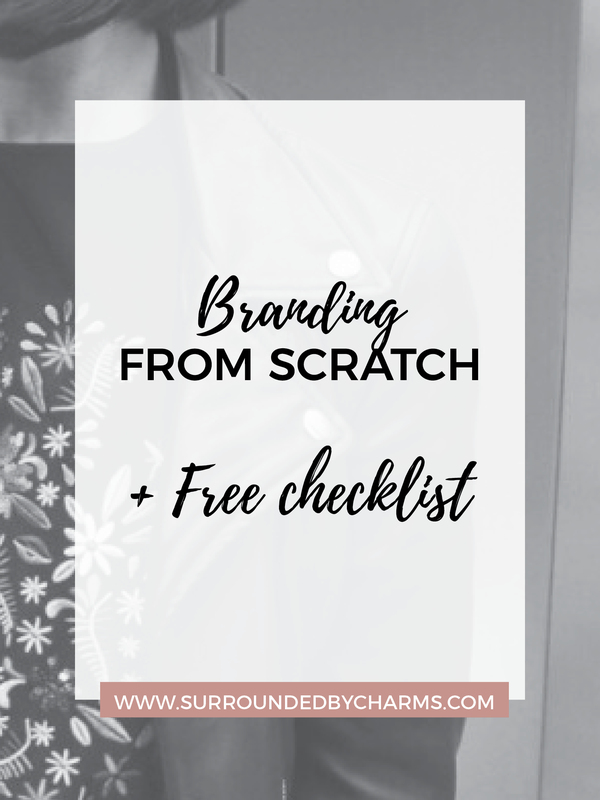 You might think what does digital media content has to do with branding if I’m just starting my brand? Well, it has to do a lot with it. Part of branding is pleasing your target customer so before starting to post some random images on your social media accounts and growing your audience. Your duty is to think about the interests of your target customers, what are they excited about, what thrills them and what do they want you to post. Choose 4-7 categories of interests and create your digital media content around them. Besides, you can read a post about an Instagram strategy where I share my tips on how to grow your followers who would engage to your content. In order to avoid mistakes and do your best from the beginning, you have to plan your brand’s imagery. It means that you have to think about the images you’re going to post on social media, on your website, what your products’ images should look like, where and how you will get all those images, and so on. Your imagery highly depends on what kind of business you’re running. Think about what social media platforms will you use, who’s your target customer, what images you need to have on your website, what marketing materials you’ll need and so on. Make a list of all those cases when images will be needed and decide how they should look like, what vibes you want them to create and where you’ll get all these images. You might need branded patterns and surfaces for product packaging, website, emails or some social media posts (e.g. quotes). Patterns and surfaces are really helpful when it comes to making your brand more vibrant and unique. When you’re just starting out, you might be pretty skeptical about them and might think you don’t need them but when you’ll be creating your email marketing campaigns or some other marketing materials you’ll be glad you have them. This part is also related to the images you’ll be using but it’s particularly about the background of your images. It’s extremely important for product images on your website and social media. On the website, you’ll list all your products and they must be photographed on the same background, another way it would look chaotic and incoherent. Speaking of images for social media, you probably want them to look attractive and appealing so I suggest you think about styling, flat-lays and decide on the props and styling you’re going to use. You can find a lot of ideas on Instagram or Pinterest. Before launching your brand, make sure your product order, invoice and email templates are ready. They all have to be similar and match your brand. They have to be pretty simple and not distract from the main information. It’s more than a copyright information at the bottom of your website, it’s about your images, copy and all the content that you create online and offline. Make sure you state your copyright wherever needed and mark your images. It might seem like a lot of things you have to decide on but please, enjoy the process and make your brand amazing from the day one! 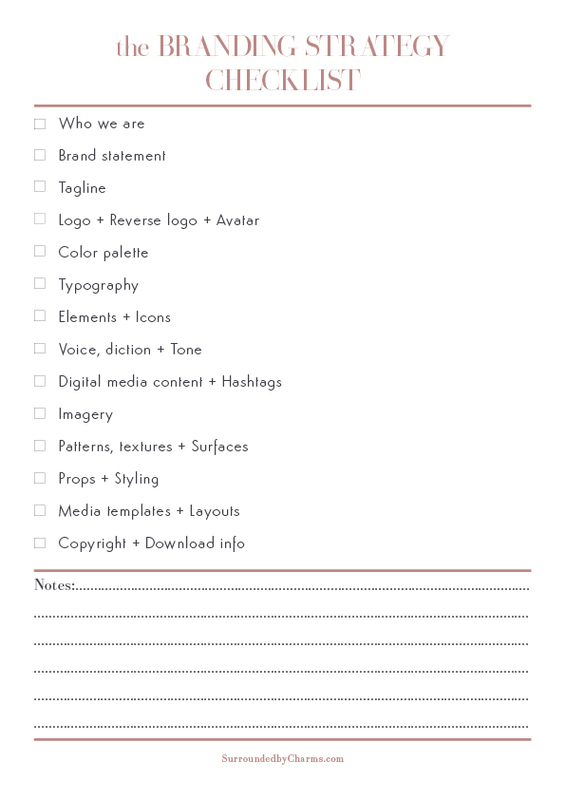 Oh, and download this Branding Strategy Checklist to be sure you haven’t missed anything!